Giraffes are herbivores and eat a diet of leaves, mostly from the acacia tress that are plentiful on the African savannahs. Giraffes need to consume huge quantities of leaves every day, so they often have to roam a fair distance to ensure adequate food. Giraffes eat several hundred pounds of leaves a week and chew and regurgitate their food several times before it finally goes through the rest of the digestive system. 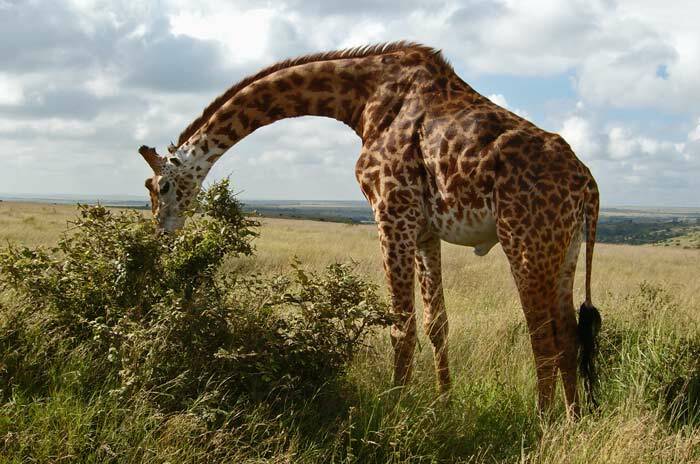 The giraffe’s height and long neck and tongue play important roles in securing food. Their long legs and necks ensure they can reach the top of the trees to get the leaves, and the animal’s tongue is also 21 inches long and very muscular. The giraffe wraps its tongue around the leaves to pull them off the trees.